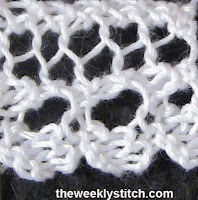 Can you ever go directly from an edging pattern to say a shawl pattern with the same yarn and needles? I hate to put on fringe, as was looking for a prettier edge for my prayer shawls. I'm looking for a very similar version of this using 9 stitches instead of 7.making it a deeper edging. Help!